Hello to all of you Debbiedoo’ers! I am so thrilled to be here with you today to take you on a tour of my home. Debbie is a total rock star in our book and she has been just as encouraging and supportive of us as she has been to so many of you! Don’t you just love her? I’m going to try and show you around without too many words but anyone who has been around me for more than 2 seconds would tell you that this might be a near impossibility! We purchased our home 4 years ago after a very long search. We waited and saved and waited and saved and waited some more and all the while hoped we might find something in this particular neighborhood. We wanted established trees and a little bit of elbow room between houses which can often be hard to find in our neck of the woods. A flat, fenced backyard for the kiddos was also a must! When this house came on the market it just perfectly fit the bill. When we found it we realized that it would need a little bit of lovin’ to help it reach it’s full potential but we were up for the challenge! Imagine holes in doors and walls, cabinets hanging off their hinges, trees growing through the deck, etc. Our neighbors immediately loved us because the bar had been set so low that anything we did seemed simply wonderful to them! Oh, hey, that’s me! Welcome to my home! I live here with my incredible hubby and our two loveable, rascally kiddos. Our foyer is always flooded with light thanks to a giant skylight up above. You definitely need plenty of those when you live in the Pacific NW! You could walk straight ahead and find yourself in the rear of the house where we do our real “living”. A.K.A where you will be greeted by cracker crumbs, sippie cups, and any assortment of toys to trip over. If you do decide to venture forth in that direction, you will pass by this charming little built-in cabinet which may or may not have made me squeal with delight upon seeing it for the first time! Just beyond you can get a peek into the kitchen and breakfast room. But, let’s hang out in the foyer for a bit more ok? To your right is the office which also connects to a full bathroom. On your left is the Living Room. We are currently in the process of making some flooring decisions for these front rooms and the staircase. The existing carpet is in incredible shape and is very high-quality but I am eager to lighten and brighten! Our Dining Room recently got a little bit of a lift when I took a couple of cans of spray paint to my brass chandelier. Of course I had to wipe off a shameful amount of dust first! But, I absolutely love how it turned out! OK, NOW we can go on into the kitchen. Here is the view from the kitchen looking back towards the breakfast area and the Family Room. See that carpet? Don’t blink because in less than 2 minutes it will once again be covered in a multitude of Squinkies and Playmobile Zoo pieces and all of the cushions from the chairs. Let’s get out of there while we have the chance! On your way back you will pass my most favorite find ever. That beautiful piece of “art” was found by yours truly at TJ Maxx and my darling hubby lugged it all over the house for me while I hemmed and hawed about where it should go. As he walked past this wall he said, “it’s going here” and I said, “sold”! God bless his little heart, he has quite the design sensibility doesn’t he? If you turned left and went down the hall you would pass the bathroom and then walk straight into my recently made over Mudroom. Let’s go on upstairs, shall we? I promise I didn’t mean for that to sound as “suggestive” as it did! At the top of the stairs and through a set of double doors is our Master Bedroom. I made almost all of the pillows along with the draperies out of fabric from remnant bins. That little love seat at the foot of the bed was a Craigslist find and turned out to be a piece from Ballard Designs. Score! And this is just about as far as you are allowed into the Master Bathroom folks! If you come any farther you will be greeted by mounds of laundry which were thrown into the closet for the sake of these photos. Heading back out we find ourselves in the rascals wing of the house. And a quick peek at their Playroom which is currently “under construction”. You’re totally exhausted from all of these photos and can’t wait to go home. But thank you so much for coming to visit me at my home in beautiful Oregon, and a huge THANK YOU to Debbie for inviting me to share it with us today! Now, if you will excuse me, I must go before all of the closet doors pop open from being stuffed full of things so that I could take these photos. Thank You~Vanessa for having us over to your Fabulous, warm and welcoming home. If my friends here do not know the gals Vanessa and Heather over at the Picket Fence…they are very special Ladies. 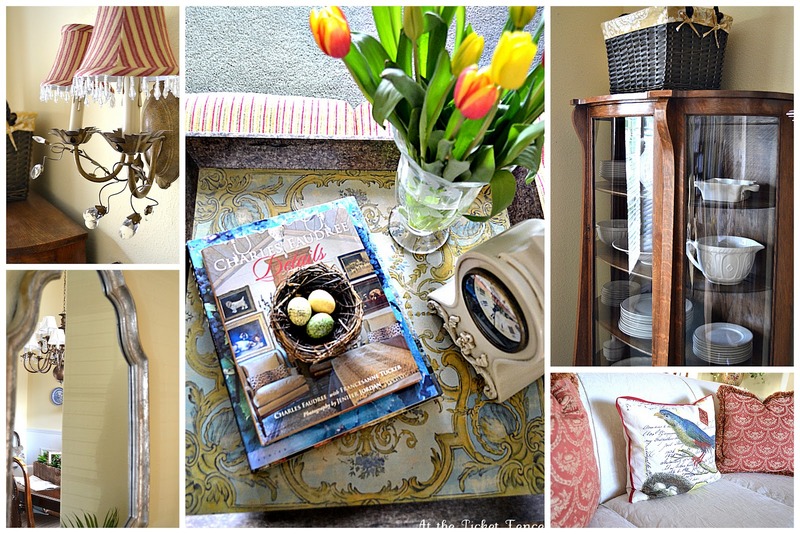 Their blog is fabulous and they always have something fun and fresh to share. Vanessa’s home is just fabulous! I had never seen her master before and it is stunning! Thanx for having us over! What a gorgeous home! 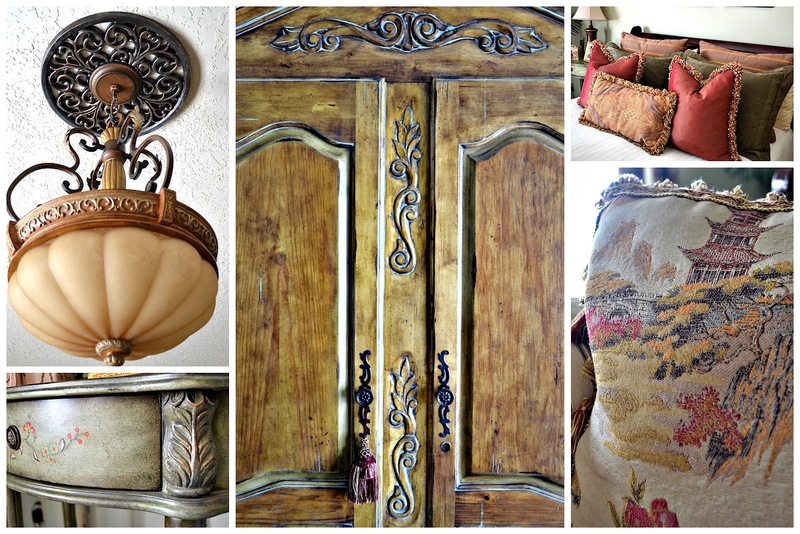 Vanessa has really turned the house in to a warm and inviting home with many beautiful details. I love how the doors are painted gray. Gorgeous, gorgeous, home. The master bedroom really caught my eye, with the ornate details and finishes. Thanks for the tour. I, too, have seen a few rooms here and there, but the full “Monty” (I mean tour) was very impressive. Vanessa is so sweet (Heather, too) & her home truly reflects her personality. It’s beautiful. Thanks to you, Debbie, for this great party you are hosting! Vanessa, your home is warm, welcoming and truly stunning at the same time!!! I could move in in an instant. It reads traditional but I see the hints of the Oregon coast with the slate tiles and the warm wood tones. I think this is the first time I actually READ the entire content and didn’t just look at the pictures. I don’t know how you do it with the little ones. You should be so proud of your beautiful home and the work that you and the Hubs have put into it. Gorgeous home! I love the light and bright look, and that nook in the kid bedroom is dreamy! Fabulous job! What a gorgeous home this is I love all the lighting and the kitchen is just great. Thanks for sharing. Thanks for posting this tour! Vanessa’s home is gorgeous. I’m totally in love with her fornt doorscape. Is that a word? It is now:) The black door, the plants, the chairs with pillows! Shut the front door! For one, I adore that chunky white moulding in your kitchen. Stunning!! Wonderful job, your home is very inviting and you did an awesome job of photographing it and giving us a tour. 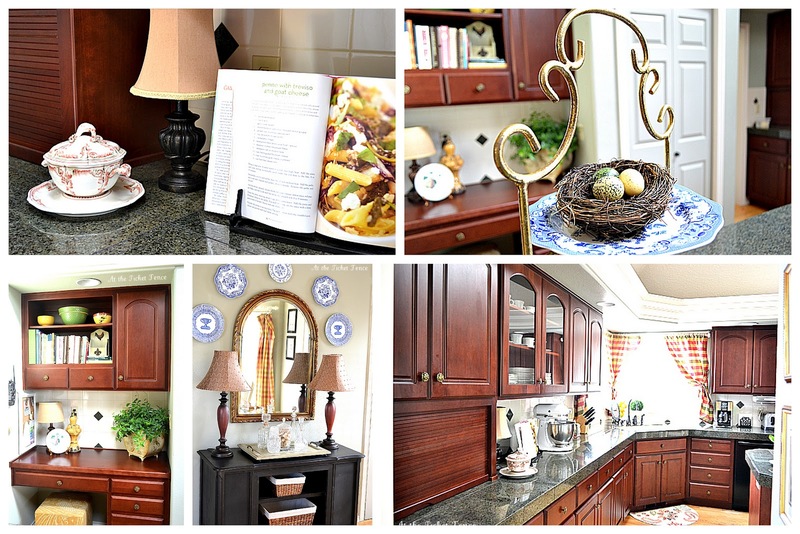 I love your kitchen, the cabinetry is beautiful and such a rich warm color. I know everyone these days is painting their wood white, but I think this ‘trend’ may pass. Stained wood will NEVER go out of style – just sayin’. Having worked in the construction industry I don’t think many people realize the trend to painted wood has come about because it’s inexpensive. Most people can’t afford STAIN GRADE wood for trim and doors and cabinets, so the builders use paint grade wood in the new homes and so it has become accepted as “updated” to paint your wood. Makes me a little sad – especially since the previous owners of my house painted over ALL the stain grade trimwork in the house before I purchased it. EXCEPT the cabinets in the kitchen which they left an ugly golden oak color. I would have painted those cabinets and left the trim stained! In very expensive homes they use a combination of stained and painted woods and I think this will be the desired look in the future. What a beautiful home Vanessa! Your sense of decorating is wonderful! I’m with you on having a “non-white” kitchen! I love your master suite! You are a lucky lady! I would have killed to have such a home when my kids with that young! Looks like you and hubby have done a lot of great work and brought it back to life! I have a house next to me that wass let go and is recently being updated! YAY! Debbie- I’m glad your birthday was so awesome! I imagine those people in the background were just not used to such a happy bunch of people! LOVE LOVE LOVE your home Vanessa, I think I was able to see some new rooms today! And I love your non white kitchen LOL. Have a fabulous weekend. Loved the tour of Vanessa’s home! It feels so warm and welcoming; and you can see the love that she has poured into it! I even loved her commentary along with it…just like taking a personally guided tour! I LOVE VANESSA, her home is warm and beautiful just like her. Gorgeous home and so beautifully decorated. Thanks for sharing it. Vanessa is a sweetheart and has a beautiful home! I think this is the first time I saw the outside. Loving all that pretty curb appeal! Thanks for sharing her beautiful home with us Debbie and thanks so much for doing these features every week, I look forward to them! Oh, thank you sooooo much everyone for these lovely comments! You all know how to put a smile on a girl’s face. 🙂 And thanks again to you Debbie for letting me hang out with you over here today! You know I LOVE sweet and beautiful Vanessa and her stunning home! She’s done an amazing job transforming their spaces, and I love that I’ve been “along for the ride” for almost every project she has conquered! I’m still blown away by the transformation of their mudroom … she’s got serious “skeelz,” and I’m blessed to call her such an inspiring friend! Wonderful decision in sharing her home with all of us, Debbie … thank you! Vanessa has certainly made her home a warm, cozy, and gorgeous sanctuary for her family…It is as beautiful as she is! Vanessa, what a gorgeous home! Every detail is so pretty and every room is so welcoming and inviting! I love you master bedroom and your kitchen is gorgeous! Thank you for taking us into your home! Vanessa, you have a beautiful home. 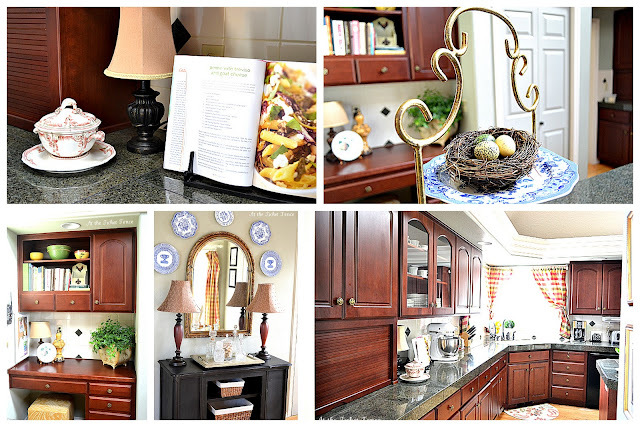 I’m always so glad to see wood cabinets still making a showing in kitchens. As beautiful as white kitchens are, I prefer the warmth of wood cabinets, which is what have too. Thank you Debbie AND Vanessa for allowing us to see that beautfiul Pacific Northwest home! So many delights for the eye to see! Hey, Vanessa, I loved your comments about the closets being stuffed so you could take pictures…that is how I prepare for company myself. I have a little poster that says “The house was clean yesterday, sorry you missed it.” YOU have an excuse with little rascals around…I don’t . Beautiful. I feel like I have been there before as it reminds me of friends former home in Issaquah, WA. And I love the new mudroom, can I come over and leave some mud in it? I’ll take the clothes out of the closet and wash them while I am there. I love your beautiful home! The yellow walls are so cheery and inviting and your cherry cabinets in the kitchen are warm and wonderful, and timeless. I thought the spray-painted chandy looked great! The transferware plates on the wall are pretty! The master bedroom is serene in green and you made some wonderful pillows!! Gorgeous kids rooms!! They are so lucky! What a fun tour of Vanessa’s house!! Love that she throws her laundry in the closet to take pics (sounds very much like me)!! Her house is warm and comfortable and fabulous just like her! Love the cubes in her family room, the fact that she made her curtains from remnants and that her family really lives here!! I love that I got to see all of Vanessa’s home in one post. I just love Vanessa and her design choices are beautiful. What a gorgeous home and what an entertaining post. Thanks everyone for stopping over today to view Vanessa’s gorgeous home. It truly is as warm and cozy as her blog. So glad that I came by to see this OPEN HOUSE…Vanessa has one beautiful home!! Simply gorgeous ~ inside and outside! You have an incredible talent for decorating. The kitchen is to die for! I have a space about the size of a closet. :/ Each room is special and I love each one. Your daughter’s room is a lovely retreat I’m sure. Not enough adjectives to describe the beauty ~ thanks so much for allowing us to visit! P.S. Debbie, thanks a million for doing these weekly home visits!